Last month at E3 2010, OnLive debuted their streaming video game service. For those who haven’t heard of it, think of it like Hulu or YouTube, but for games. Both Windows and Macintosh users can choose to play from a selection of popular titles without having to install each game. OnLive doesn’t need a decked-out gaming rig either, all the intensive rendering processes take place on a remote server. While the service opens the doors to gaming for millions of users with inexpensive machines, it does have a few drawbacks worth mentioning. OnLive isn’t simply a distribution medium like Steam, it’s entirely different. 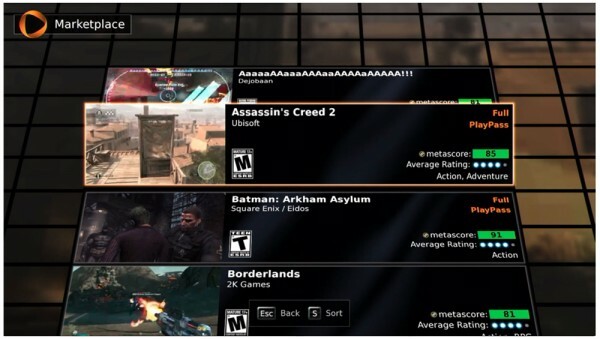 While the latter requires users to download gigabytes of data for each game, OnLive doesn’t. Getting setup and running is rather easy. The installer for both Macs and PCs is just a few megabytes in size and only has a few minimum requirements: a dual-core processor, 1280-by-720 resolution display, and a high-speed internet connection. And that’s about it, gamers won’t need a powerful graphics card to play the latest games. In fact, the service is so flexible that users can begin a game on one machine and sign into their account on another, regardless of the OS, to pickup where they left off. Game developers may find OnLive attractive as well: building a single version of their game for this service instantly makes it compatible with both Windows and Macintosh machines. OnLive’s business strategy is different from anything we’ve seen in the gaming industry before. The company’s technology processes graphics-intensive games on their cloud-based servers and delivers the final product to customers: audio and video. 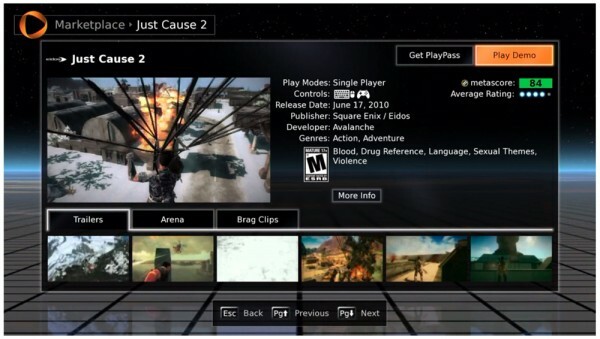 The little application on each subscriber’s machine sends commands from a keyboard, mouse, or controller back to OnLive’s servers. With some behind-the-scenes coordination, the entire service claims to work in harmony. For masses out there with outdated machines, OnLive presents an opportunity to play the latest games without having to spend a fortune. As for notable titles, some include Assassin’s Creed II, Dirt 2, Mass Effect 2, Batman: Arkham Asylum, Splinter Cell: Conviction and a few more. While the initial pitch may sound interesting, there are a few issues worth noting. First, gamers will always need an internet connection, even if simply working your way through a single-player mission. And that’s not all, you can’t have just any internet connection, OnLive requires speeds of nearly 5.5 Mbps. That pretty much excludes most DSL customers and let’s not talk about the part of America that’s still on Dial-Up. For users who do have a great internet connection, despite the claims of the company’s representatives, it’s likely that there will be decent amounts of lag. That fact alone excludes most serious gamers from even considering the service. Playing a round of a multi-player first person shooter may not be so much fun anymore. I should also note that OnLive doesn’t work with WiFi yet, users will need to tether themselves down with an Ethernet cable. As for graphics quality, OnLive is comparable to other video streaming technologies. Let’s put this in terms of something just about everyone is already familiar with. Think about the quality of a Blu-ray movie or an even a DVD, then compare that to streaming a video from Hulu or YouTube. While faster internet connections and HD content is becoming more widely available, there are always buffering issues. While OnLive’s compression technology claims to intuitively adapt, picture quality won’t look bad, but it won’t be as great as playing it natively. And as for game titles, when I said “a few more,” I meant it. There are only about 20 available at this time. When it comes down to considering this service over purchasing retail box games or using Steam, price becomes an important factor. 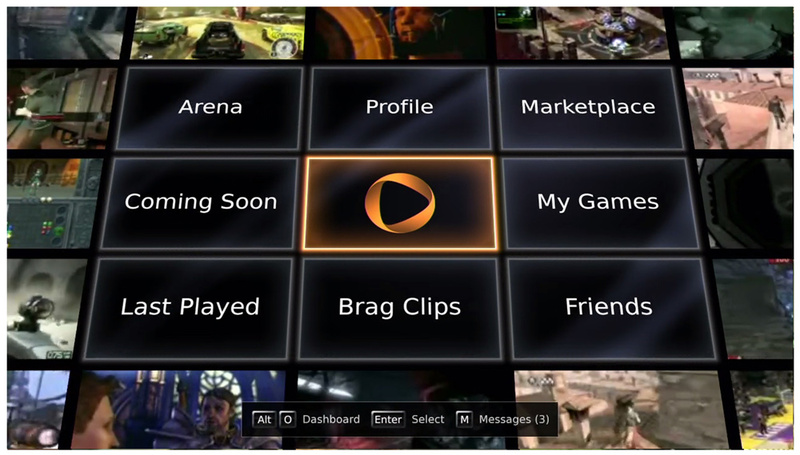 OnLive charges a $15 monthly fee for access to the service, but not games. Getting access to a particular title will cost customers an addition one-time fee. F.E.A.R. 2: Project Origin goes for just $20 while Prince of Persia: The Forgotten Sands is $50. Unfortunately, this presents one major drawback: when customers cancel a monthly subscription, they will no longer have access to games they’ve purchased. While OnLive tries appeal to users who can’t afford expensive computer hardware or dedicated consoles, the bills add up. While an Xbox 360 S sells for $300, two years of an OnLive subscription costs $360. Let’s not forget that consumers get to keep Xbox hardware and games which isn’t possible for OnLive users. It’s a hard sell, but nonetheless an interesting one. If pricing drops significantly, it might be worth considering. Until then gaming on consoles or computers is still a more affordable option. Update (7/21/10): It was just pointed out that my Xbox price comparison was somewhat inaccurate since I failed to mention the cost of a Xbox Live subscription which goes for $50/year. However, even with an additional $100 added to the price tag, customers will still need to buy games. The fact that games are unplayable after a user ends a subscription still makes the service hard to recommend. I have signed up for it as well and just tried it today. It appears to be a total waste. None of the games are free. You have to buy the games at similar prices as you would see in retail stores. If the game prices are the same why not just purchase and download it from a retailer online? You don’t have to deal with internet issues then and you own the copy of it yourself. You can play demos of some of the games for free but big deal. There are a few games you can “rent” and have access to for 3-5 days for a smaller fee. This is the only real benefit I see to doing this I suppose. Also perhaps a small benefit would be that you could play the games on multiple computers without having to reinstall the game each time. Its too bad I thought we beta testers would get to play all these games for free. I guess it sounded too good to be true. I’m glad I’m a beta tester and not paying a monthly fee. I can’t imagine paying a fee just to pay another fee to play anything. Pricing is a real issue and will potentially doom this concept. To buy a game, give it to a ‘landlord’ and then have to pay that landlord to play is ridiculous. The service should be free to gamers, a place where they can store all their games including CD’s they bought and make OnLive a real gamers home, then charge the game developers a selling fee, including something if someone tries the demo (you can limit how many times someone can play a demo, then if they want to continue the gamer can either fork over the demo fee or buy the game). There are other ways to make money, but the current business plan will leave Onlive broke as people leave… they’re assuming no one knows how to do basic math to know it’s not worth the money, especially if you can’t access a game you paid for and ‘own’.